Hubby and I have a wonderfully balanced marriage: he's a foodie and I am a geek. We both love gadgets (with different purposes entirely), we both covet more than we can afford (which means we feel the same pain), we both use vocabularies that confuse our family (from java app to epicuria). Yep, both geeks in our own way. However sometime, something comes along that brings together both of our passions. Like using the Google "site:" search to find recipes on Epicurious.com and then running over to our 300+ collection of Bon Appetit and Gourmet magazines to find the issue that contains the recipe we intend to make. 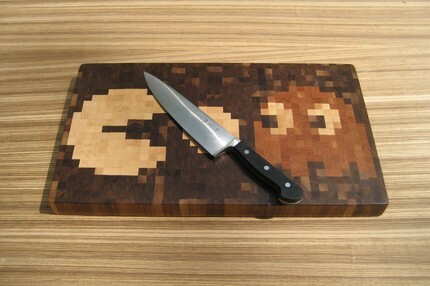 Sometimes, it's as simple as a super geeky cutting board. Geek and foodie never looked better. Available on Etsy (where else? ).